His sessions brought me to tears and inspired me to be a better teacher and person. I truly believe I transformed my mindset and many of my approaches to teaching because of ideas I heard through him. He is motivating, funny and the thing I like the best- relatable. He is amazing and I can’t wait to see him again! Darren Kuropatwa has been the leader in demonstrating how to use a class blog to capture everyone's contributions to the class and then to use the power of group collaboration to make sure the "notebook" accurately reflects what has been accomplished. Darren knows the power of students who understand that their work is being referenced by organizations around the world. 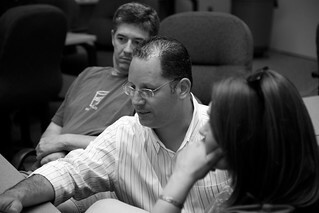 His students are contributors to the world's "knowledge commons". Not only does he teach calculus, he teaches students that one of the responsibilities of global citizenship is publishing knowledge products to add value to the world. The work Darren did for us was incredible. He remains the strongest influence so far on our teacher professional development project. "Teachers such as Kuropatwa are a rare breed. What he's doing is cutting edge." Founder and President of Complexive Systems Inc.
"Darren is one of those one-per-centers that are leaders." "... a few kids were talking about you in my class the other day. They were discussing how you’re the best teacher, you use a variety of teaching methods (they actually said that), and that you are “scary” smart. [One student] went on about how you always explain things to kids, are generous with your time, explaining marks, etc., I am telling you this because I want you to know that you’re very much respected by the people who count the most – the students." My students, colleagues, and I are extremely lucky to have had Darren Kuropatwa as our guest. Darren presented “A Day in the Life of a Teacher Teaching with Technology“. It was a wonderful presentation that seems to have really inspired the session participants ... Darren is an amazing, innovative, and inspiring teacher. What a great experience in class tonight. Darren Kuropatwa is a math teacher who embraces technology in his classroom and shared with us his typical day (from start to finish!). He painted a wonderful picture and shared his class blogs, his insights, and his passion. Thank you Darren. The presentation this week with Darren Kuropatwa was very inspiring. As the feeling of this new technology that we are learning is at times overwhelming, this presentation was a breath of fresh air. It was nice to see how this technology can be worked into the classroom. I have only one word to say . . . Thanks! I had the privilege of listening to a presentation from Darren Kuropatwa, who in my opinion, is an expert in the field of Educational Technology. . . this is very obvious!! He is someone that, in a perfect world, all educators would strive to be like. Darren (for those of you who don’t know) is a teacher who teaches a variety of grade 9-12 Mathematics classes integrating the use of technology to amplify student learning. In the eyes of a self-proclaimed ‘rookie blogger / techie’ , he is someone that I learned an awful lot from last night. We were very fortunate to have Darren Kuropatwa present to our EC&I 831 class last night: “A Day in the Life of a teacher teaching with technology“. I think I sat through most of the presentation with my jaw on my keyboard! He is absolutely AMAZING! Last night I had the opportunity to attend a presentation by Darren Kuropatwa, an educator from Winnipeg. After witnessing how Darren incorporates technology into his classes I am giving him the label of ed tech guru. What he is doing within his classroom is exciting, cutting edge, engaging, etc, and that is through the eyes of an administrator. It's crazy how much this teacher can help me. He will make sure everyone in the class understands what is going on, letting no one fall behind. He gives everyone an equal opportunity having no favourites and he'll make you feel open to discuss and argue about a problem that you have about a certain topic. He honestly changed me as a person and a professional that day! Darren only sees possibilities and the genius inside each child. When I listen to him speak I am filled with hope and endless opportunities for this next generation.